ANDREW JACKSON. Newspaper. Niles’ Weekly Register, March 7, 1829. Baltimore, Maryland: Hezekiah Niles & Son. 16 pp. (17-32), 6¼ x 9⅞ in. 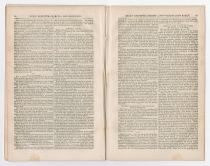 During Jackson’s two terms, he concluded about seventy treaties with Native Americans in the South and Northwest that initiated a policy of Indian removal to lands further to the west. Also central to Jackson’s administration was the Nullification Crisis of 1832-1833, in which South Carolina declared the federal Tariffs of 1828 and 1832 unconstitutional and therefore null in that state. Although supportive of states’ rights, Jackson insisted on the supremacy of federal law. Congress passed a lower tariff acceptable to South Carolina and also a Force Bill, authorizing the president to use military force against South Carolina. The state backed down, and both sides claimed victory, but the issues remained until the Civil War, three decades later. 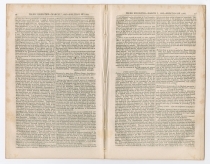 The end of Jackson’s first term and his second term were dominated by the Bank War, Jackson’s opposition to the recharter of the Second Bank of the United States in 1836. 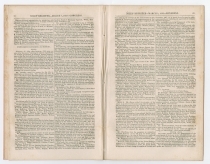 After Congress passed a bill in the summer of 1832 to recharter the Bank, Jackson vetoed it, declaring that the Bank supported the wealthy at the expense of the common man. In the election that fall, Jackson won in a landslide over Henry Clay. Jackson’s war on the Bank, which involved transferring federal monies to state banks, was one of the factors, along with reckless speculation in land and railroads, that led to the Panic of 1837 shortly after Jackson left office. 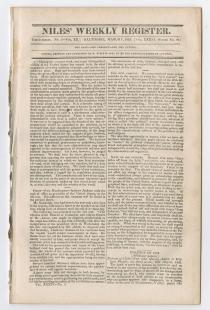 This issue also includes a list of acts and resolutions passed by the 20th Congress at its 2nd session (p21/c1-22/c1); closing proceedings of the 20th Congress, 2nd session (p22/c1-p28/c1); and letters regarding territorial disputes between Maine and Canada (p29/c2-p32/c2). Andrew Jackson (1767-1845) was born in the Waxhaws region on the border between North and South Carolina, just weeks after his father died. While serving as a courier for the militia in 1781, Jackson was captured by the British. His mother died of cholera while nursing American prisoners of war in Charleston harbor when Jackson was fourteen years old. He boarded with several different people over the next several years and studied law. Admitted to the bar in North Carolina in 1787, he moved to Nashville, Tennessee, in 1788, where he met Rachel Donelson Robards, who was unhappily married. He married her in 1790, thinking her husband had obtained a divorce, and remarried her in 1794, after the divorce was final. Jackson served as attorney general and was a delegate to the Tennessee Constitutional Convention of 1796. He represented Tennessee in the U.S. House of Representatives from 1796 to 1797 and in the U.S. Senate from 1797 to 1798. He resigned in disgust over national politics and returned to Tennessee, where he was elected to the Tennessee Supreme Court, a position he held until 1804. In March 1814, Jackson led Tennessee militia to defeat renegade Creeks and force the Creeks to surrender 23 million acres in Georgia and Alabama to the United States. After accepting a commission as brigadier general in the U.S. Army, Jackson attacked British and Spanish forces in Pensacola, where the Spanish surrendered and the British fled. Learning of a planned attack on New Orleans, Jackson moved his forces there, and on January 8, 1815, drove the British attackers back from the city with heavy losses, making him a national hero. After the war, he remained in command of Army forces on the southern border and led troops in Florida during the First Seminole War (1816-1818). Although Jackson won a plurality of the popular and electoral votes in the presidential election of 1824, the House of Representatives gave the Presidency to John Quincy Adams. In 1828, Jackson won the election over Adams, but his wife died shortly after the election. Jackson began a two-term presidency marked by the removal of Native Americans to west of the Mississippi River, the denial of a recharter to the Second Bank of the United States, and threats of secession from South Carolina nullifiers over the Tariff of 1828. 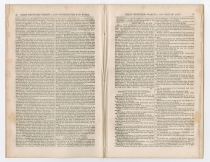 In the nullification crisis, Jackson insisted that no state could nullify an action of the federal government. Although the Compromise Tariff of 1833 met some of the nullifiers demands, Jackson paired it with a Force Bill authorizing the use of military force to uphold the tariff. His effective attacks on the Second Bank of the United States contributed to the Panic of 1837, which led the nation into a depression for several years. After his second term ended, Jackson retired to the Hermitage in Tennessee. 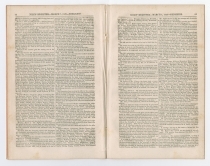 Niles’ Weekly Register (1811-1849) Editor and publisher Hezekiah Niles (1777-1839) began this small-size newspaper in Baltimore in 1811, and it became a prime source for political news during the first half of the nineteenth century. It focused on worldwide political, commercial, agricultural, and industrial news and paid limited attention to cultural or social issues. 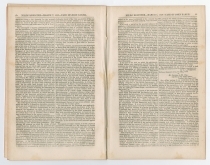 Niles focused on publishing the texts of major documents, including treaties, laws, court decisions, speeches, official reports, and proceedings in Congress. 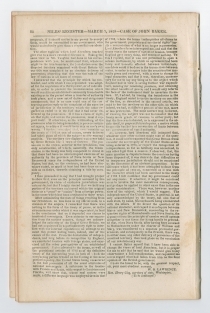 Although a Whig of the Henry Clay type, Niles avoided partisan attacks, and the non-partisan quality of the Register gave it an authority no other publication could match. It was one of the most widely-circulated magazines in the United States, and Niles was one of the most influential journalists of his day. Plagued with health problems, Niles retired in 1836, and turned the Register over to his son William Ogden Niles, who served as editor until 1839. 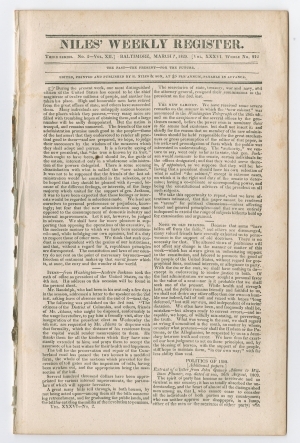 Jeremiah Hughes purchased the Register in 1839 and served as editor until March 1848, when he suspended publication. 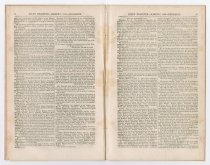 George Beatty revived the Register in Philadelphia but published it only from July 1848 to September 1849.